From 1937 to 1986 the Nielsen 7-UP Bottling Co. was a major economic contributor to the City of Cuero, TX. The company serviced a seven county area with Cuero being the approximate geographic center. This exhibit has been developed to preserve this vignette of Cuero’s history. History of Nielsen 7-UP Bottling Co. of Cuero: In 1937, Harold Nielsen, then a Kraft cheese salesman, worked out of San Antonio, Texas. He wrote to St. Louis, MO for a Seven-Up franchise to cover a seven county area. 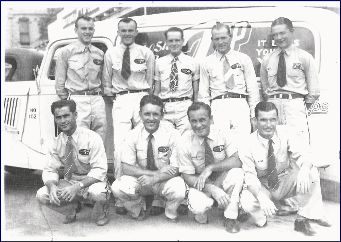 The franchise was approved, and Mr. Nielsen came to Cuero to start Nielsen 7-UP Bottling Company. The town of Cuero was chosen for the production center because of the reputation of the “best” water in the area. The company offices and production plant were located in the 100 block of E. Church St.
Over the years, the company obtained other franchises which included Big Red, Suncrest, NuGrape, Frostie and other brands which are no longer in existence. Most of these brands are represented by the bottles on display in the Museum. These same bottles once were displayed in the street side windows of the 7-Up plant here in Cuero. In 1956, Mr. Nielsen died and his wife, Dollie M. Nielsen, continued to run the business with the help of Mr. Joe Kenigseder, who had been with Mr. Nielsen from the beginning of the business. In 1974 Robert H. Nielsen and Barbara Nielsen Wade formed N-7 Corporation and purchased Nielsen 7-UP Bottling Co.
Beginning of Soft Drinks: In 1807 Townsend Speakman, a Philadelphia druggist, started adding fruit juices to carbonated water. This is believed to be the birth of the carbonated beverage industry. It was not until 1824, however, that a practical method of bottling carbonated beverages was discovered. The name ‘soda pop” came in to common use because one of the early bottles, when opened, gave off a loud pop. History of 7-UP: Seven-UP was first marketed in October of 1929 when Mr. C. L. Girgg, a general store manager in Missouri, began selling his eleventh new soft drink formula called, “Bib-Label Lithiated Lemon-Lime Soda.” At that time it was one of over 600 lemon based soft drinks on the market. 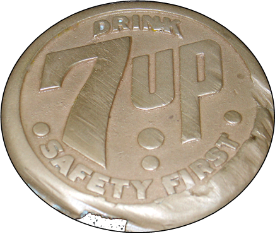 The name was soon changed to 7-UP; the 7 coming from the seven flavors used in the drink formula. Mr. Grigg’s original company name of “The Howdy Company” was changed to “The Seven-Up Company.” In 1986, the company was the third largest soft drink brand sold in the world.